The following is an organized list of the more commonly asked questions that we receive. You may find the answers that you are looking for here but if you don't, please feel free to contact us with your question. How do I find out what jobs I’m qualified for? In order to qualify for a state job, you must first meet the minimum qualifications. These requirements can be found on any job announcement under the heading: "Minimum Requirements". Announcements for both current job listings and continuous job listings can be accessed here on our website. They can also be obtained from our office or any local Employment Service Office. You should review each announcement carefully, noting the location of the job opening, minimum qualifications, description of job duties, and any special requirements. Taking the time to thoroughly review each announcement will help you avoid applying for jobs that may not interest you, or for which you may not qualify. You may also refer to our Employment Guide ( Employment Guide Definition), which contains a listing and brief description of many jobs in the State classified service. Jobs are categorized by occupation which can help you quickly identify a number of job classes in your area of interest. Finally, if you still cannot find what you are looking for, you may call the State Personnel Department directly and speak to one of our employment counselors. This person will be happy to help you in your job search. You may call the personnel divisions in the various state agencies in order to find out who is currently hiring. They should be able to provide you with the number and location of vacancies within their department. Telephone numbers for State agencies can be located in the blue pages of the telephone directory. I am not a resident of Alabama. Can I still apply for a state job? Yes. There is no residency requirement in order to be employed in the State of Alabama Merit System. My address has changed. Should I notify you? Yes. If you have an address change, please send it in writing to the State Personnel Department. How can I be notified when a particular job is announced? You may request to be placed on the mailing list to be notified when the job of your choice is opened for receipt of applications. You should submit your request in writing to the State Personnel Department (you can find a detachable request form located in our Employment Guide. Your request must include your full name, address, social security number and the class codes) of those jobs in which you are interested. You may also place your name on the email notification list found here - Job Mailing List. Where is your office located? Is parking available? Our office is located in the Folsom Administrative Building, Third Floor, 64 North Union Street, Montgomery. We are located at the corner of Union Street and Monroe Street, across from the rear of the Capitol. Free parking is available at Cramton Bowl, or you may park at any of the 2-hour meters located nearby. 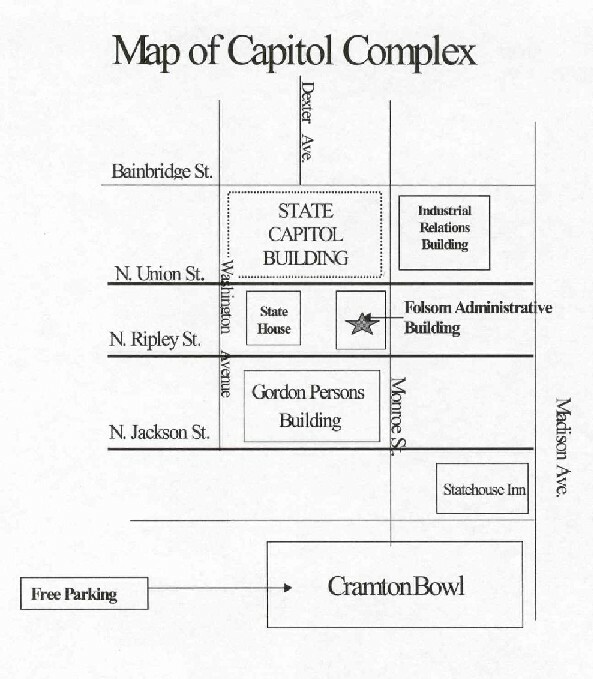 (See Map of Capitol Complex). 2. We accept Xerox copies as well as faxes. Our fax number is (334) 242-1110. 3. Some applications can be submitted online using the Online Employment System (OES). Where can I obtain job applications/announcements? You may download applications and announcements from our website. You may also get them from your local employment service office or at our office in Montgomery. Also, if you are on one of our mailing lists, you will receive information when a job is open for recruitment. How long will it be until I am on the register? We try to place qualified applicants on a register in as timely a manner as possible. The actual time frame depends on a variety of factors, including the number of persons applying for a job, the type of exam used for the job, and the needs of the agency using the job class. I sent in an application and it was returned to me. Why did this happen? An application can be returned for several reasons. One reason is that important information is missing from the application, such as Social Security number, address, signature, etc. Another reason is that a person did not indicate what exam they were applying for, or they tried to apply for more than one job on the same application. Also, an application can be returned for clarification of education/experience, necessary coursework needed for a particular job, or any other supplemental information. Most returned applications will be accompanied by a letter or note requesting additional information, or will have sections circled in red pencil to indicate which areas need completing. You may request to have your school, or a third-party transcript service send your transcript directly to State Personnel Department at transcripts@personnel.alabama.gov. This email address is only for educational correspondence. Any emails sent to this address by an applicant will be discarded. Continued abuse of the transcript email will result in disqualification of the applicant. Please use the Contact Us link if you wish to send us an email. Once your transcript is verified and accepted, it will remain on file. If you continue your education after your transcript has been submitted, we will need an additional copy of your finished official transcript. Applicants must also submit an official college transcript for each accredited postsecondary academic institution attended. What is your policy on accepting degrees or college coursework from foreign universities? Applicants with degrees from foreign countries are required to provide verification of their educational credentials for any classification in which their degree/coursework is needed to meet the minimum qualifications or to receive credit during the scoring process. Credential evaluation services are used to determine what a foreign degree is equivalent to in reference to a U.S. degree (Associates, BA, BS, Masters, etc.). These services can also provide course-by-course equivalencies as well. Evaluations submitted from services other than those listed above, will not be accepted. You can submit a resume to supplement your application, but you must submit an official State application. What happens to my application if I apply for a class that is closed? Your name will be placed on a mailing list and your application is shredded. When the job is opened for applications, you will receive notification in the mail. At that time, you can submit an application. Can I use the same application for several different job classes? No. You must submit a separate application for different job classes/options. However, you may make copies of your original application and submit a separate copy for each class/option. Please make sure that the correct class title/code and option is listed on your application(s), and that each application accurately describes your education/experience. It is recommended that you also keep a copy for your records. Can I apply for a job requiring a college degree, if I have not yet graduated? Please review the Job Announcement for it will indicate if an Applicant may apply prior to graduation. What kind of test will I have to take to get on the register? The type of test you take will depend on the type of examination being administered for a particular job. The job announcement will provide this information under the section titled "Type of Examination." How often is an exam administered? If a job is on continuous recruitment, the exam will be administered several times a year. This can vary depending on the number of applicants, the type of exam, and the needs of the hiring agency. If the exam is current and only open for a short time period, it will be administered shortly after the closing date. The way scores are calculated depends on the type of examination procedure administered. For more information, please refer to the section of the Application Process titled: "How you are rated". I was placed on the register 6 months ago, and have since obtained an advanced degree. I feel this would improve my standing. Can I submit this additional information? No. Additional education or work experience cannot be considered after your name has been placed on a register. However, you are allowed to re-apply nine months after being placed on a continuous register. At that point, you may submit any additional education and experience on your new application. If I take the written test again in 9 months, and score lower, can I still keep my original score? No. Your most recent test score will be used in placing you on the register. If I apply for two exams being given on the same date, will I be able to take them both? If an exam center is testing both in the morning and afternoon, and there is room available, you will be scheduled to take both exams. However, if the exam center only has one session, you will be scheduled to take the exam for the application that was received and entered first into the State Personnel Department’s automated filing system. Also, if a written exam is only being given once, that exam is given priority over exams given continuously. I received a scheduling card to take an exam in a city other than where I live. How can I take the exam in the city where I live? The State Personnel Department has over 10 exam centers throughout the state, including sites in Montgomery, Mobile, Birmingham and Jacksonville. When you complete your application, you have the opportunity at that time to indicate your top three choices for testing. You should indicate the city closest to your residence as your first choice, the next closest as your second choice, etc. Whenever possible, we try to accommodate an applicant’s choice of test locations in the order indicated on your application. Factors affecting whether your first choice is honored, include availability of test centers, number of applicants being tested, etc. I have a disability. How do I request special accommodations to take a State exam? If I need special accommodations to take a State exam, where will I take the exam? You will be scheduled to take the exam at the Alabama Department of Rehabilitation Services office nearest you. If you live in Montgomery, you may also be scheduled to test at the State Personnel Department. What testing accommodations are made for persons with various disabilities, e.g., deafness, blindness, or other visual limitations, learning disabilities, quadriplegia, etc.? An interpreter for the deaf from the Alabama Department of Rehabilitation Services or other agency may be provided. Individuals may be designated to read exam instructions and questions. Some tests may be set in Braille. Some tests may be audio taped. Some tests may be printed with enlarged fonts and/or bolded. Applicants are allowed to use equipment such as a closed circuit TV to enlarge print. Applicants may be allowed extended time to take an exam. Individuals may be designated to mark the applicants’ choices on the answer sheet. If I missed an examination for which I was scheduled, how do I go about getting re-scheduled? You must submit another completed application form for the position(s) for which you wish to re-test. One important purpose of testing is to identify the differences in test scores that reflect real differences among candidates. Banded scoring is a statistical procedure for grouping test scores that statistically are not meaningfully different from one another. In banded scoring, bands are set objectively and mathematically. The people in a band are similar to each other in that statistically there is no meaningful difference in their scores. Sometimes Band 1 may be very large and at other times it may be small. The candidates' performance on the test determines the size of the bands. Think of a band as a group of tied scores. The scores are so close to each other that they are basically the same. Banding compares your performance on the test to other test takers' performance, and groups your score with others that are statistically the same. People with the most experience do not always fall into the top bands. Time spent in a job may not be the same as possessing a knowledge, skill, or ability needed to perform the job. The people with the strongest knowledges, skills, or abilities (those who did best on the exam) should be in the top bands. Candidates with seniority or experience do not automatically perform best on the test. When several people are placed in the same band, it does not mean that those people do not differ. Instead, it means that their scores on the exam do not differ enough to be separate scores. A register is a list of names of persons who have successfully competed by examination arranged in order of their final rating (score). What does the "Rule of Ten" mean? The Rule of Ten refers to the certification of the top ten eligible job candidates (including the names of those with tied scores) to the requesting agency. When a hiring agency requests a register from the State Personnel Department, the Rule of Ten is utilized to provide them with a list of the most qualified (highest scoring) candidates. If more than one vacancy is being filled, the name of one additional eligible candidate will be certified to fill each additional vacancy. How can I find out my standing on the register? How long do I remain on the register? If you were placed on a continuous register, you will remain on the register for a period of two years from your original placement date. If you were placed on a current register, you will remain on it for the life of the register, until it is replaced. How can I keep my name on the register? In order to remain active on an employment register, be sure to respond to any availability information you receive. Also, be sure to keep your address current so that you may receive information on available jobs. If you are on a continuous register, be sure to reapply to take the exam within two years so your name won’t be removed. Why did my position on the register change? While your score will not change on a register, your standing can change. Factors such as names being added and removed, availability changes, and hiring can affect your standing on a register. You may obtain your standing information by submitting a request in writing to The State Personnel Department or logging into your OES Account . I was told I am 'inactive" on a register. What does that mean? Your name can become inactive if you fail to respond to job offers or decline three job offers. In order to prevent becoming inactive, be sure to respond to all correspondence you are sent, even if you are not interested in a job. What is the re-employment register, and how do I get on it? If you are a former employee who had permanent status and left state service in good standing due to resignation, or if you were separated during probation for budget reasons, you may have your name placed on the re-employment register for the job classification of the position you most recently held. You must submit this request in writing to the State Personnel Department. You will then be placed on this list for two years. Beyond two years, eligibility on the list can be extended one year at a time for up to two years. In order to qualify for the extension, you must submit a written request that includes verification of having performed related work or having taken related coursework. In order to change your availability , please send written notification to the State Personnel Department. Be sure to include your full name, Social Security number and the class title/code of the job(s) in question. I have been placed on a register. How long will it be before I am called for an interview? What are Veteran's Preference Points? 5 or 10 points are added to the final score received by veterans and, in certain cases, their spouses on open competitive employment tests. How do I claim Veteran’s Preference Points? 1. Veteran (5 points) - Requires DD214 or document showing dates of service and type of discharge. Note: Must be active duty for other than training purposes. 2. Disabled Veteran (10 points) - Requires DD214 or document showing dates of service and type of discharge and the V.A. letter of disability dated with the last 6 months. Note: Letter must be kept updated until register is established or you lose the extra 5 points. 3. Deceased Veteran's spouse (10 points) - Requires DD214 or document showing dates of service and type of discharge and marriage and death certificates. Note: Cannot be claimed if spouse remarries. 4. Disabled Veteran's spouse (10 points) - Requires DD214 or document showing dates of service and type of discharge and the V.A. letter of disability dated with the last 6 months. Note: Cannot be claimed unless still married to the disabled veteran who because of this disability is not qualified. 5. Permanently Disabled Veteran (10 points) - Requires DD214 or document showing dates of service and type of discharge indicating veteran is permanently disabled or DD214 or document showing dates of service and type of discharge and the V.A. letter indicating permanent disability. How can I transfer from one agency to another? In order to serve state agencies, the State Personnel Department maintains a list of persons in various state jobs who indicate they are willing to transfer to another agency. In order to transfer, you first must have permanent status in the particular job class of interest. You should then consider contacting the personnel manager of the agency to which you wish to transfer, to inform them of your interest. You can also contact the State Personnel Certification Division and ask to be added to the transfer list. However, you are not required to be on this list in order to be eligible for a transfer. All transfers must be approved by both appointing authorities and the State Personnel Director. The receiving agency may choose whether or not it will accept an employee’s leave balance prior to a transfer.